It was a big weekend for me. Magic happened in my craft room. Ok, well not that kind of magic. 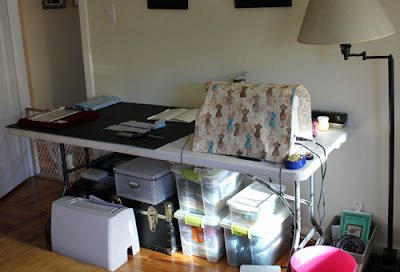 You see, while I'm lucky enough to have a dedicated craft space, I was using a crappy, makeshift sewing table. It's not just a regular card table, but a long table that folds in half, thus making it just slightly less stable. That meant that while I was using my sewing machine, my craft table would be bouncing all over the place. Literally, I had to hold my machine down with one hand just to make sure that it wouldn't be jiggling all over the place. One fan of this was my cat, Simon, who would love to lay on my sewing table while I was using the machine. I don't want to know why. I started to wonder if there must be a better way to go about this. I was shopping around on CraigsList when I remembered the affordable furniture mecca... Ikea! I needed something inexpensive, but functional. I found the perfect set online and added it to 'one day' list. That day came this weekend. We had a full weekend of dance competitions but mine was supposed to end pretty early on Sunday. That would leave enough time to go by and pick one up. What I didn't plan on? Another cold. Yeah, I managed to weasel my way out of the last one, only having the sniffles for a couple of days. This one? Not so easy. Especially after a morning of competing... I wasn't feeling so great. So while we were in and out of Ikea in 10 minutes, I started to go downhill fast. That's where my wonderful husband came in. He put it together while I was knocked out on cold meds. I woke up to find my wonderful new sewing table assembled and ready to be filled up. Well, I'm still working on that last half, but I can tell you that sewing on it is wonderful! My machine no longer bounces around making tons of noise, and my sewing is so much less stressful! Simon did come by to check it out. I don't think he was impressed. Though he did enjoy a nice nap on it while I was assembling my dress for the upcoming Pastille challenge. Well, with the dance competition and work, I've been crazy busy, so sewing has been a bit limited. I think I'm sitting out the Sew Weekly refashion challenge and just going to work on Pastille and the next couple of challenges. I also have a fun trip planned for the end of March so I went to get some sewing in for that. More on that later! 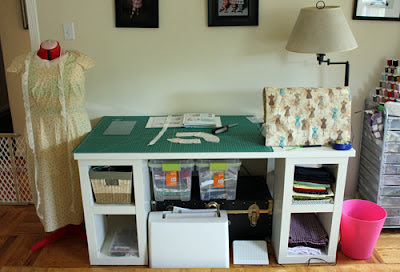 Your sewing table is very nice, your dh was a sweetie to put it together for you. Hope you are feeling better! I just treated myself to a table off Craigslist because I was using that same awful folded in half table you had! I can go so much faster now - especially on the serger, and everything just seems so much nicer. I hope you enjoy yours as much as I enjoy mine. Your new space looks great. The new table is so smart. I have the same folded table you have - which was temporary when I bought it with the idea that I would pull it out for cutting material and then put it away. But a new table just isn't in near future - yet! 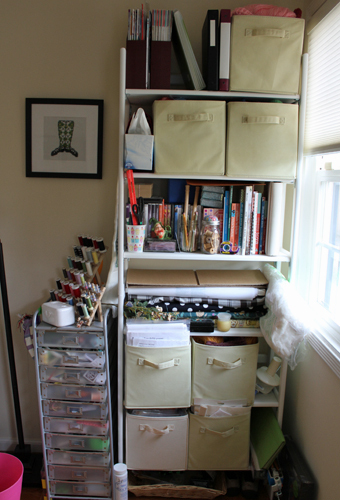 Your new sewing space looks so clean and organized! The table is my favorite part - it looks much more stable now!